Interstitial cystitis/painful bladder syndrome (IC/PBS), is a severely debilitating chronic condition that is frequently unresponsive to conventional pain medications. The etiology is unknown, however evidence suggests that nervous system sensitization contributes to enhanced pain in IC/PBS. In particular, central nervous system plasticity of glutamatergic signaling involving NMDA and metabotropic glutamate receptors (mGluRs) has been implicated in a variety of chronic pain conditions. 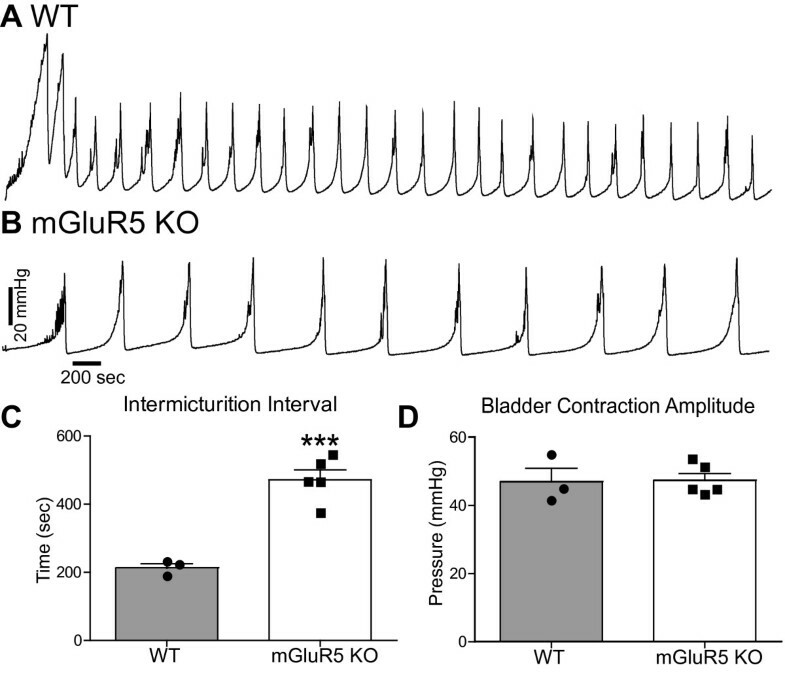 Here, we test the hypothesis that mGluR5 mediates both non-inflammatory and inflammatory bladder pain or nociception in a mouse model by monitoring the visceromotor response (VMR) during graded bladder distention. Using a combination of genetic and pharmacologic approaches, we provide evidence indicating that mGluR5 is necessary for the full expression of VMR in response to bladder distention in the absence of inflammation. Furthermore, we observed that mice infected with a uropathogenic strain of Escherichia coli (UPEC) develop inflammatory hyperalgesia to bladder distention, and that the selective mGluR5 antagonist fenobam [N-(3-chlorophenyl)-N'-(4,5-dihydro-1-methyl-4-oxo-1H-imidazole-2-yl) urea], reduces the VMR to bladder distention in UPEC-infected mice. Taken together, these data suggest that mGluR5 modulates both inflammatory and non-inflammatory bladder nociception, and highlight the therapeutic potential for mGluR5 antagonists in the alleviation of bladder pain. Interstitial cystitis/painful bladder syndrome (IC/PBS) is a serious and painful condition of unknown etiology that affects 3-6% of women in the United States [1, 2]. The major clinical symptom of IC/PBS is pain upon bladder filling (distention) leading to urinary frequency and urinary urgency . The current available treatments are often ineffective and do not treat the underlying pathology. Rodent bladder-injury models that induce some of the symptoms observed in IC/PBS have been used to evaluate potential treatments for IC/PBS [4–9]. One injury model, bacterial cystitis (urinary tract infection, UTI) is known to cause a similar constellation of symptoms as observed in IC/PBS (i.e. urinary frequency and urgency [10–12]). In addition, bacterial cystitis can be modeled in rodents through bladder exposure to uropathogenic Escherichia Coli (UPEC) [13, 14]. Bladder infections due to UPEC are responsible for approximately 80% of UTIs in otherwise healthy women [15, 16]. Understanding the underlying molecular mechanisms of both non-inflammatory bladder pain and inflammatory bladder pain due to UPEC infection could lead to the development of novel treatments for painful bladder infections as well as for IC/PBS and possibly other visceral pain conditions. Glutamate is the predominant excitatory neurotransmitter in the mammalian nervous system [17–19]. Glutamate mediates its effects through two major classes of glutamate receptors: ligand-gated ionotropic receptors (iGluRs) and G protein-coupled metabotropic glutamate receptors (mGluRs). Among the metabotropic glutamate receptors, one subtype, mGluR5, is of particular interest in the context of pain conditions. mGluR5 is expressed throughout the peripheral and central nervous system  and has previously been shown to have a pro-nociceptive role in a variety of somatic pain models [20–25] and some visceral pain models [26–28]. Specific to visceral pain models, mGluR5 was found to modulate gastroesophogeal and colorectal afferent sensitivity [26, 27, 29]. Based on this prior information, a previous study examined the ability of the mGluR5 antagonist, MPEP (2-methyl-6-(phenylethynyl)-pyridine), to reduce bladder pain responses in naïve (uninjured) rats . While this study suggests a potential role for mGluR5 in bladder pain, the evidence is based exclusively on the use of MPEP, which has recently been shown to act non-selectively in vivo . Thus, these intriguing initial findings are in need of validation. Furthermore, the role of mGluR5 in inflammatory bladder pain is unknown. Here, using a combination of genetic and pharmacological approaches we demonstrate that mGluR5 regulates both bladder nociception and normal bladder function in naïve mice. Furthermore, we observed an increased VMR to bladder distention in mice infected with UPEC. Finally, UPEC-induced hyperalgesia is reduced by treatment with the specific mGluR5 antagonist, fenobam. Together these data strongly support the hypothesis that mGluR5 is necessary for the full expression of inflammatory and non-inflammatory bladder nociception and may be a relevant target for the treatment of bladder pain arising from multiple pathologies, including IC/PBS. To assess bladder nociception in response to distension, we utilized the distension-evoked visceromotor response (VMR). The VMR is a spinobulbospinal reflex to bladder distention, increased in decerebrate mice/rats and absent in mice/rats with an acute mid thoracic spinal cord transection [32–34]. Bladder distention reliably produces pain and/or discomfort in humans , and is frequently used in rodents as a visceral pain model [5, 30, 33]. To provide genetic evidence supporting a role for mGluR5 in bladder nociception, we tested the VMR to bladder distention in mGluR5 knockout mice (mGluR5 KO) compared to their WT littermates. Stepwise increases in bladder distension resulted in progressively larger VMR in wild type mice, as shown in Figure 1B. Furthermore, mGluR5 KO mice showed a statistically significant decrease in the evoked response to bladder distention (VMR) in the noxious range of pressures when compared to the VMR of WT littermates (p < 0.0001). Reduced visceromotor response to bladder distension in mGluR5 knockout mice compared to wild type littermates. A. Representative VMR tracings from a WT and mGluR5 KO mice. As the intravesicular pressure is increased (20-80 mmHg), the EMG activity of the abdominal muscle (VMR) is also increased. The total amount of activity (area under the curve) during the 20 second distention is calculated to determine the evoked response at each pressure. B. mGluR5 KO (n = 18) mice have a significantly blunted VMR when compared to WT littermates (n = 15) +/- SEM,* p < 0.05, **p < 0.01, ***p < 0.001. 2-way ANOVA with Bonferroni post-hoc test. There were no obvious histological differences observed between mGluR5 KO mice (1D) and their WT littermates (1C). In both, the urothelium (above dashed line) has normal layers of superficial facet cells (arrows), intermediate cells (black arrowhead) and basal cells (white arrowhead). There are several possible reasons that genetic ablation of mGluR5 could lead to the observed suppression of the VMR. Recent work has implicated the urothelium in the sensation of physical and chemical stimuli . One possibility is that loss of mGluR5 could lead to anatomical changes in the bladder lining, thus altering the response to distension. We therefore examined histological sections from mGluR5 KO mice and their WT littermates. The absence of mGluR5 does not appear to impact bladder architecture, as the bladders from mGluR5 KO mice are histologically indistinguishable from WT littermates. The superficial, intermediate and basal epithelial cells are present (see Figure 1C and 1D) and the underlying mesenchyme and muscle layers also remain intact. Furthermore, the barrier formed by the superficial cells is normal as evidenced by Uroplakin III staining (data not shown) in both the WT and mGluR5 KO mice. Therefore, the absence of mGluR5 affects the response to noxious bladder distention but does not alter gross urothelial architecture. Compensatory changes in gene expression represent a potential confound to any experiment utilizing genetic manipulation. Thus, the robust phenotype observed in the mGluR5 KO mice could be the result of compensatory expression changes in other genes that have a role in bladder nociception. An acute pharmacological blockade of the receptor represents a potentially powerful approach to complement these findings from genetically modified mice. However, as mentioned above, the pharmacologic agent (MPEP) used in prior studies shows a clear lack of specificity in vivo . To ask whether mGluR5 activation is acutely involved in distention-induced bladder nociception, we tested whether specific pharmacologic inhibition of mGluR5 with the selective antagonist fenobam [31, 37, 38], would suppress the VMR to urinary bladder distention. Systemic (intraperitoneal (IP)) administration of fenobam to WT mice resulted in a statistically significant reduction in the response to bladder distention compared to pretreatment baseline responses (Figure 2B, p < 0.0001), whereas treatment with vehicle had no statistically significant effect on VMR compared to baseline (Figure 2A). Thus, pretreatment with fenobam mimicked the reduced nociceptive response to bladder distention that was observed in mGluR5 KO mice relative to their WT littermates (compare Figure 1A and 2A). We next evaluated the effect of fenobam on the VMR of mGluR5 KO mice. Surprisingly, treatment with either vehicle (DMSO) or fenobam caused a small but statistically significant decrease in the VMR evoked by bladder distention compared to baseline responses in mGluR5 KO mice (Figure 2C and 2D, p < 0.001 and p = 0.007). The selective mGluR5 antagonist, fenobam, is analgesic in distention-induced bladder pain model. A. Treatment with the vehicle used to dissolve fenobam (100% DMSO) has no effect on the response to bladder distention. B. Treatment with an mGluR5 antagonist, fenobam, is analgesic in a bladder distention-evoked pain model. C&D. 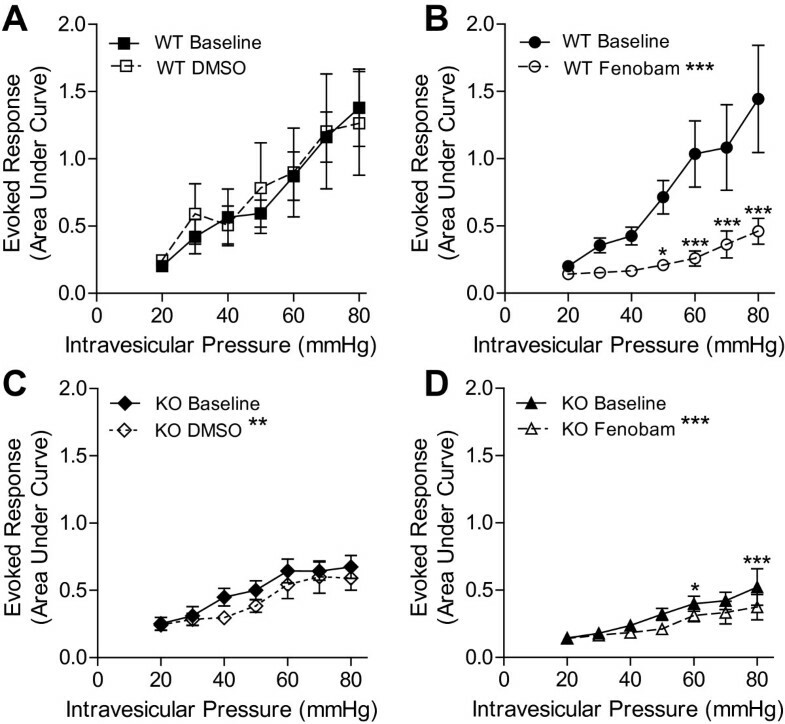 Fenobam and DMSO reduce the evoked response in mGluR5 KO mice. +/- SEM,* p < 0.05, **p < 0.01, ***p < 0.001. 2-way ANOVA with Bonferroni post-hoc test. To test the role of mGluR5 in urodynamics, we compared the cystometry profile of mGluR5 KO mice and their WT littermates. mGluR5 KO mice had a significantly increased IMI (212.3 seconds versus 471.5 seconds, for WT and KO, respectively, p = 0.0006) (Figure 3A-C). Despite the difference in IMI, the average amplitude of bladder contractions was not significantly different in mGluR5 KO mice relative to their WT littermates (Figure 3D, p = 0.9215). mGluR5 KO mice have an increased intermicturition interval. A. Representative urodynamic profile of a WT mouse. B. Representative urodynamic profile of a mGluR5 KO mouse. A-C. The IMI in WT mice was significantly smaller when compared to mGluR5 KO mice (WT baseline IMI 212.3 ± 12.94 N = 3, mGluR5 KO IMI baseline 471.5 ± 29.14 N = 5). D. However, there was no difference in the bladder contraction amplitude. ***P < 0.001 unpaired Student's t-test compared to WT IMI. To determine if the voiding behavior we observed in mGluR5 KO mice was the result of genetic ablation of mGluR5 or the result of compensatory changes, we acutely treated WT mice with fenobam or vehicle and measured the effect on urodynamics. While vehicle treatment had no effect on IMI (160.2 seconds versus 177.1 seconds, for baseline and vehicle (DMSO) respectively, p = 0.66, Figure 4D), fenobam treatment increased the IMI when compared to the baseline IMI. The IMI before fenobam treatment was 182 seconds (n = 8). After IP fenobam treatment, four of the eight mice stopped bladder cycling and micturition immediately (Figure 4C), while four of the mice had significantly increased IMI (481.3 seconds, p = 0.031, Figure 4D and 4E). The mean time to resume bladder cycling and micturition after systemic fenobam administration was 18.6 minutes. This suggests a tight coupling between mGluR5 activation and micturition cycling. The acute effect of the mGluR5 antagonist also suggests that the increased IMI observed in mGluR5 KO mice is not likely due to developmental changes as a result of genetic ablation of mGluR5. Fenobam treatment increases the intermicturition interval. A-C. Representative urodynamic profile of WT mice before and after treatment. An intraperitoneal (IP) injection with fenobam significantly increased the IMI in 4/8 mice treated (B, E), while 4/8 mice stopped cycling (C). In the mice that stopped cycling, the mean time to resume bladder cycling and micturition after IP fenobam administration was 18.6 ± 5.0 minutes. The IMI was not significantly affected by IP DMSO (n = 7) (A, D). *P < 0.05 paired Student's t-test compared to baseline. Our results, together with previous studies [30, 39, 40] suggest that mGluR5 is involved in the mediation of micturition cycling and controls nociceptive responses during noxious bladder distention; however, the role of mGluR5 in inflammatory bladder nociception is unexplored. We therefore used the UPEC model of bladder inflammation to examine the role of mGluR5 in inflammatory bladder nociception. We found that UPEC infection resulted in an increased VMR to noxious bladder distention when compared to mock-infected littermate controls (Figure 5A, p < 0.0001). Furthermore, in mice whose bladders had been distended, UPEC infection produced an increased infiltration of polymorphonuclear leukocytes observed throughout the full thickness of the bladder tissue (Figure 5B, arrowheads), as well as an increased tissue thickness of both the urothelium and mesenchyme compared to distended mock-infected mice (Figure 5C). Noxious bladder distention combined with UPEC infection resulted in greater histological damage as measured by tissue inflammation scores when compared to mock-infected mice with noxious distention (data not shown) . UPEC infection (alone and with distention) resulted in barrier disruption through a loss of superficial facet cells, while noxious distention alone had no effect on these cells and the barrier remained intact (arrows, Figure 5C). UPEC Infection results in histological changes and bladder hyperalgesia. A. 24 hour infection with uropathogenic E. coli (UPEC) increases the VMR to bladder distention when compared to mock-infected (PBS) littermates. B. Infection with UPEC results in an increased infiltration of polymorphonuclear leukocytes (arrowheads), and a sloughing of the superficial facet cells. C. Distention alone does not result in the loss of superficial facet cells (arrows,). +/- SEM *p < 0.05, **p < 0.01, ***p < 0.001. Unpaired 2-way ANOVA with Bonferroni post-hoc test. In mice with a UPEC-induced UTI, mice treated with vehicle had an increased VMR when compared to baseline (Figure 6A, p = 0.0007). While vehicle treatment increased the VMR, treatment with fenobam resulted in a significantly reduced VMR when compared to pre-fenobam measurements (Figure 6B, p = 0.0006). In contrast, vehicle had no effect on the VMR in mice mock infected (with PBS instead of UPEC, Figure 6C). In these control mice (mock infected), treatment with fenobam significantly reduced the VMR when compared to pre-treatment VMR measurements (Figure 6D). These results are consistent with those observed in WT mice (not mock-infected, Figures Error! Reference source not found. A and 2B). Clinically, visceral pain is often treated as a variant of somatic pain under the assumption that one neurological mechanism may be responsible for both visceral and somatic pain . However, conventional treatments for somatic pain are often ineffective in treating visceral pain, indicating significant differences between visceral and somatic pain [42, 43]. This is likely due, in part, to intrinsic differences between visceral nociceptors and non-visceral nociceptors (Reviewed in: [43–45]). Our results support this difference as we found that blocking mGluR5 activation resulted in a decreased VMR in the absence of injury. Whereas previous work has demonstrated that blocking mGluR5 activation has no effect on somatic pain in the absence of injury [31, 46]. Although the role of mGluR5 in inflammatory bladder pain is unclear, a few reports have shown that mGluR5 antagonism can lead to analgesia in visceral pain models (acetic acid writhing and colonic distention) [23, 24, 27, 30, 37, 47–49]. A recent publication reported that an mGluR5 antagonist, MPEP, effectively reduced the nociceptive VMR to noxious distention of non-inflamed bladders in rats . However, MPEP, has since been shown to have off-target effects, as it retains analgesic efficacy in mGluR5 KO mice . Thus, the precise role of mGluR5 in bladder distention-induced nociception remains unclear. Further, it is unknown whether mGluR5 activation has a role in the more clinically relevant condition of inflammatory bladder pain. In the present study, we demonstrate that mGluR5 is necessary for the full expression of distention-induced bladder nociception in naïve as well as UPEC-infected mice. Here, we demonstrate the importance of mGluR5 in non-inflammatory bladder nociception using both genetic and pharmacologic techniques. First, mice lacking mGluR5 have a significantly reduced response to noxious bladder distention when compared to their WT littermates. 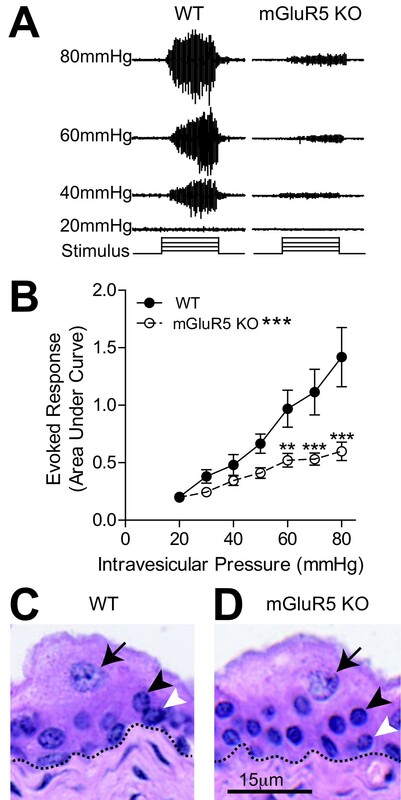 Despite this dramatic effect, mGluR5 KO mice have no baseline motor deficiencies . However, genetic deletion of mGluR5 could result in unpredictable upregulation or compensation of other genes involved in bladder function. Acute systemic treatment with a selective mGluR5 antagonist (fenobam) mimics the blunted VMR observed in the mGluR5 KO mice, suggesting that the absence of mGluR5 activity accounts for the differences in VMR as well as the cystometric profile observed in mGluR5 KO mice. Together these data suggest that mGluR5 is necessary for the full expression of distention-induced bladder pain in naïve mice and highlight the therapeutic potential for mGluR5 antagonists in the treatment of bladder pain. Surprisingly, both fenobam and vehicle (DMSO) induced a small but statistically significant reduction in the distention induced VMR in mGluR5 KO mice. Fenobam at the dose used in this study was previously demonstrated to be specific to mGluR5 in vivo , and we do not believe that these results challenge that finding because fenobam but not DMSO, had an effect on the VMR of WT mice. Because both fenobam and vehicle significantly reduced the VMR in mGluR5 KO mice, we conclude that the vehicle is having effects in the KO that are not observed in WT mice. A possible explanation for the effects of the DMSO in KO but not in WT mice is that mGluR5 KO mice are significantly smaller than their WT littermates . DMSO has been shown to block peripheral C-fiber nerve conduction . It is possible that the volume (20 μl) delivered in relation to the weight of the mGluR5 KO mice leads to such a conduction block. The dramatic phenotype of mGluR5 KO mice as well as the significantly reduced pain response in fenobam-treated WT mice suggests that mGluR5 regulates bladder nociception. It is also possible that mGluR5 could regulate normal bladder function such as micturition. To examine the role of mGluR5 in normal bladder function, we examined the cystometric profiles of mGluR5 KO mice compared to their WT littermates. Genetic disruption of mGluR5 significantly increased the IMI, but had no effect on the bladder contraction amplitude (pressure at which voiding occurred). An increased IMI suggests that mice lacking mGluR5 are able to urinate, but they tolerate higher bladder volumes (i.e. higher bladder distension) before voiding. Our results are consistent with previous work demonstrating a role for mGluR5 in the micturition reflex [30, 39, 40]. Importantly, mGluR5 does not appear to be involved in bladder development, as bladders of mGluR5 KO mice were indistinguishable from their WT littermates upon gross inspection. These results suggest that mGluR5 has a role in bladder sensation in naïve mice. Bladder infections due to UPEC are the most common reason that women see a doctor [11, 53]. This is the first evidence that infection with UPEC sensitizes mice to noxious bladder distention. WT mice infected with UPEC had a greater VMR to bladder distention when compared to mock-infected littermate controls. These data are consistent with the finding that mice with a UTI have increased referred abdominal pain . Furthermore, our results indicate that pharmacologic blockade of mGluR5 activation can reduce the VMR to bladder distention in UPEC-infected mice. 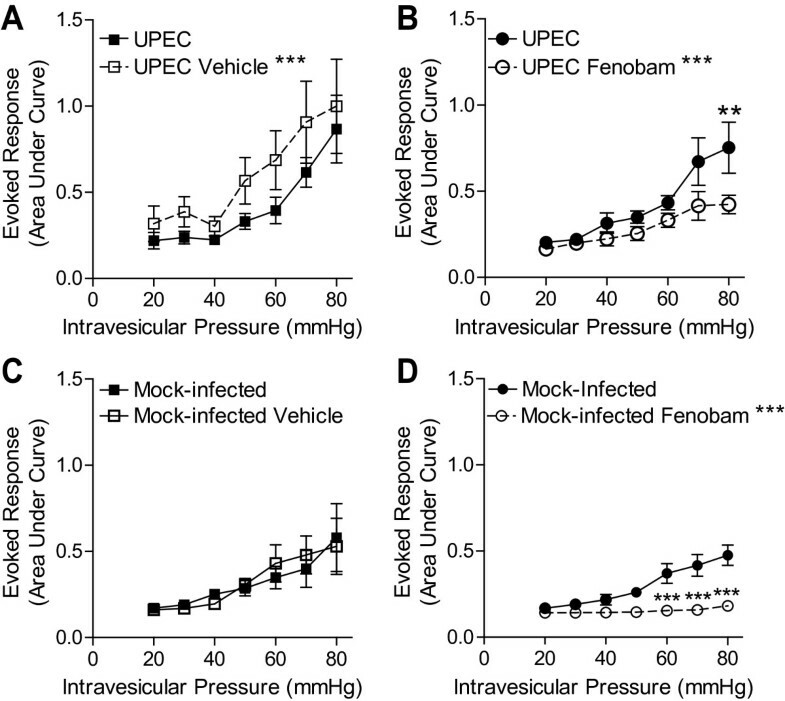 The reduction in the distention-evoked VMR after fenobam treatment in mice infected with UPEC may be even larger than is apparent in Figure 6B, as the VMR is actually increased in vehicle-treated mice (see Figure 6A). Because distention in combination with UPEC infection was more damaging to bladder histology than distention in mock infected mice, the increased VMR after vehicle is likely the result of injury induced by bladder infection in combination with repeated noxious bladder distention. Another, yet unlikely, explanation is that systemic DMSO might lead to bladder sensitization in mice with UPEC infection. In models of somatic inflammatory pain, an increase in mGluR5 expression was observed in the CNS, specifically the central nucleus of the amygdala and the spinal cord [55, 56]. Whether mGluR5 expression is altered in the context of visceral inflammatory pain remains to be determined. Up to 85% of community-acquired UTIs are due to infection with UPEC [57, 58]. Standard-of-care for a UTI is antibiotic treatment. However, in women with normal urological anatomy (uncomplicated UTI), UTIs are self-limiting . Therefore, uncomplicated UTIs will resolve without antibiotic treatment. Despite this, the pain due to a UTI necessitates antibiotic treatment for symptomatic relief. Antibiotic use can lead to UTI recurrence by selecting for antibiotic resistant bacteria . By treating the pain of a UTI rather than the infection, it may be possible to allow the UTI to take its natural course and become self-limited and reduce antibiotic-resistant reoccurrence. Based on our findings, we suggest that mGluR5 antagonists could be a useful for therapy for symptomology in UTI that could reduce antibiotic use. Although less common, bladder pain in the form of IC/PBS is a serious and debilitating medical condition. Unfortunately for patients, no reliably effective treatment options exist. Previous work has suggested a role for mGluR5 in the CNS in distention-induced bladder pain . However, the mGluR5 antagonist used in this study (MPEP) is analgesic in mGluR5 KO mice, suggesting off-target effects . Here, using a combination of genetics and pharmacology, we demonstrate that mGluR5 has a crucial role in the modulation of distention induced bladder nociceptive responses. Because in these studies mGluR5 was blocked systemically and knocked out globally, the anatomical localization where mGluR5 modulates bladder pain is undefined. In addition, mGluR5 is expressed throughout the peripheral and central nervous system [20, 21, 46, 59–62]. However, it should be noted that the mGluR5 antagonist, fenobam, readily and rapidly crosses the blood brain barrier . If the chronic pain experienced due to IC/PBS is also mediated by mGluR5, then antagonists of mGluR5 such as fenobam may be useful in treating chronic bladder pain. Antagonists of mGluR5 may have clinical potential for the treatment of both acute and chronic bladder pain. Previous work using non-visceral pain models has demonstrated that mGluR5 activity modulates the activation of ERK1/2 (extracellular regulated kinase 1/2) in both the spinal cord [25, 63] and/or central nucleus of the amygdala (CeA) [46, 64]. Inhibition of mGluR5 in the CeA is analgesic in multiple models of somatic inflammatory pain [46, 60]. Furthermore, recent work from our lab has demonstrated that inhibition of spinal ERK signaling via intrathecally administered MEK inhibitors is analgesic in both inflammatory and non-inflammatory bladder pain models . Future work can help determine the anatomical and molecular mechanisms by which mGluR5 modulates bladder nociceptive responses. All animal experiments were performed in accordance with the guidelines of the Committee for research and Ethical Issues of International Association for the Study of Pain . The experimental protocol was approved by the Washington University Institutional Animal Care and Use Committee (St. Louis, MO). All experiments were performed on female mice aged 10-13 weeks. All mice were humanely euthanized at the end of the experiments by decapitation under deep isoflurane (5%) anesthesia. Female C57BL/6 mice used in UPEC experiments were purchased from The Jackson Laboratory (Bar Harbor, ME). For experiments involving mice lacking mGluR5 (mGluR5 KO), animals were bred in-house on a C57BL/6 background and compared with wildtype (WT) littermates . Unless otherwise indicated, all mice were group housed in cages of 3-5. All mice were kept on a 12:12-h light/dark schedule with ad libitum access to food and water. Fenobam was purchased from Tocris Bioscience (Ellisville, MO), and is a specific negative allosteric modulator of mGluR5 [31, 38]. The dosage (30 mg/kg, intraperitoneal) of fenobam was chosen because it was the lowest effective dose to induce analgesia in two mouse models of inflammatory pain, and had no effect on mGluR5 KO mice . Fenobam was dissolved in 100% dimethyl sulfoxide (DMSO, Sigma-Aldrich, St. Louis, MO) on the day of the experiment. All intraperitoneal injections were 20 μl. Throughout all experiments and analysis, the investigator performing the VMR was blinded to pharmacological treatment. Visceral nociception was quantified using VMR, an electromyographic (EMG) recording of the abdominal muscle response to bladder distention that has previously been validated as a measure of nociception [34, 66]. An example of the bladder-distention induced VMR of WT mice can be seen in Figure 1. Abdominal VMRs to urinary bladder distention were performed as described previously . The mice were anesthetized with 2% isoflurane, and chlorinated silver wire electrodes were placed on the superior oblique abdominal muscle. One was placed subcutaneously across the abdominal wall (as a ground) to allow differential amplification of the abdominal VMR signals. A lubricated 24G angiocatheter was inserted into the bladder via the urethra for bladder distention. After completion of the surgical preparation, isoflurane anesthesia was reduced to approximately 0.9% until a flexion reflex response was present (evoked by pinching the paw) but spontaneous escape behavior and righting reflex were absent. Once a stable depth of anesthesia was obtained, the level was not changed for the duration of the experiment. The animals were not restrained in any fashion. Body temperature was monitored throughout the experiment and maintained using an overhead radiant light. Phasic bladder distention with compressed air was then used to evoke a VMR. The air pressure was controlled by an automated distention control device custom made in the Washington University School of Medicine Electronics Shop. The distention stimulus applied 20 to 80 mm Hg pressure (10 mmHg steps) for 20 seconds every 2 minutes. The VMR signal was relayed in real time using a Grass CP511 preamplifier (Grass Technologies, West Warwick, RI) to a PC via WinDaq DI-720 module (Dataq Instruments, Arkon, OH). These data were exported to Igor Pro 6.05 software (Wavemetrics, Portland, OR). Using a custom script, the VMR signals were subtracted from the baseline, rectified, and integrated over 20 seconds to quantify the area under the curve (see Figure 1). The VMR is presented in arbitrary units. After baseline responses to distensions 20 mmHg-80 mmHG (10 mmHg steps) were recorded, the mouse was allowed to recover for at least 30 min (level of anesthesia remained unchanged). Following baseline recordings, the mice were given a 20 ul IP injection of either fenobam (30 mg/kg, dissolved in 100% DMSO) or 100% DMSO (vehicle). A second set of bladder distentions (20 mmHg-80 mmHg, 10 mmHg steps) was started 5 minutes following administration of fenobam or vehicle and completed within 45 minutes. The investigator who tested, processed and quantified the VMR was blinded to the drug treatment and genotype. Infection with a clinical UPEC isolate, UTI89, was performed as previously described . Briefly, mice were anesthetized with isoflurane and inoculated via transurethral catheterization with 50 μl of 2-8 × 107 colony-forming units/mL of bacteria in phosphate buffered saline (PBS). Control mice (mock-infection) received 50 ul of intravesicular PBS. Following intravesicular instillation of either PBS or UPEC, the mice were individually housed. Urine was collected at 6 and 24 hours, and infection was confirmed. At 24 hours post infection, the VMR response to bladder distention was recorded as previously described . Following the VMR, isoflurane anesthesia was increased and the mice were euthanized by cervical dislocation. Bladder tissue was quickly removed and fixed in methacarn (60% methanol, 30% chloroform, 10% glacial acetic acid) . The bladder tissue was then embedded in paraffin, sectioned and stained with hemotoxylin and eosin. Photomicrographs were taken using a Hamamatsu NanoZoomer HT (Hamamatsu Corporation). Urodynamic recordings were performed as described previously . Briefly, mice were anesthetized with subcutaneous urethane (1.2 g/kg). A midline laparotomy incision was made, and the dome of the urinary bladder was exposed. The bladder dome was punctured with a 25-gauge needle. Intravesicular pressure was monitored continuously in vivo while the bladder was filled with room temperature saline at a rate of 0.04 mL per minute using a syringe pump (KD Scientific, New Hope, PA). Voiding was allowed to occur spontaneously via the urethra. The intravesicular pressure was recorded in real time using WINDAQ data acquisition program (DataQ Instruments, Akron, OH) at a sampling rate of 20 Hz. 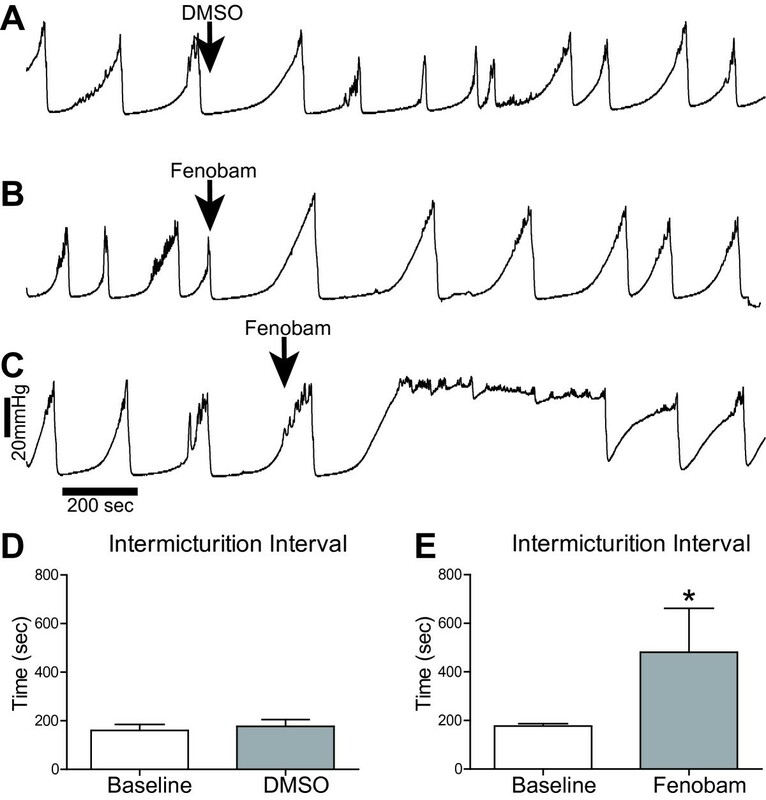 The intermicturition interval (IMI) was calculated as the average time (seconds) between peaks. The amplitude of contraction was the value (cmHg) of the peak. Lara W Crock, Kristina M Stemler contributed equally to this work. This work was supported in part by NIH grants DK089969 (LWC), T32-A1007172 (KMS), DK082315 (RWG, HHL), DK082315-02S1 (HHL), NS48602 (RWG), K99/R00 Pathway to independence award DK080643 (IUM), and research support from the St Louis Veterans Affairs Medical Center (HHL), Washington University Department of Surgery (HHL), the Alafi Neuroimaging Laboratory, the Hope Center for Neurological Disorders, and NIH Neuroscience Blueprint Center Core Grant P30 NS057105 to Washington University. The authors wish to thank the members of the Gereau lab for critically editing this manuscript. LWC, KMS, DGS, PA, CSQ and SKV performed experiments and analyzed data. LWC, KMS, SKV, HHL, IUM and RWG conceived the study and contributed to writing the manuscript. All authors read and agreed on the final version of the manuscript. KMS and LWC contributed equally to this manuscript. KMS created the cover art figure. All Authors read and approved the final manuscript.